Human trafficking is a modern form of slavery. It is an illegal trade of human beings for the purposes of forced labor and sexual exploitation. It is the fastest growing criminal industry in the world. Fake job offers is the most common way of obtaining people from different countries of the world. Bolivia as one of the least developed countries in South America suffers greatly from human trafficking. Economic crisis, political instability and poverty have made Bolivia a source country for children, men and women being trafficked for forced labor and prostitution. 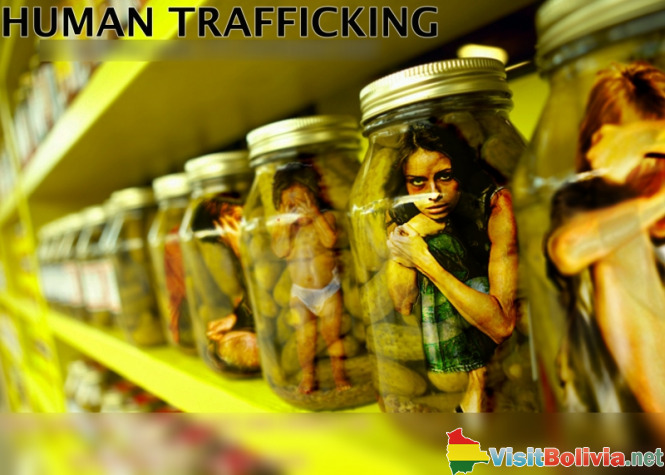 Chile, Argentina, Brazil, Spain, United States and Peru are the countries where a lot of Bolivians are trafficked to. The majority of them are forced to labor in agriculture, on ranches and Brazilian plantations. Children are mainly used as domestic servants as well as for working in agriculture and mining. The story of a young girl Patricia Suarez reported in March 1997 is a bright example of women exploitation. She is originally from Bolivia who was trafficked to China, Hong Kong, where she was offered a job. Desperate for money she left her 2 months old baby with her family and left for China unaware that she was heading to being trapped in nightclubs and brothels. in May 2008 more than two hundred Bolivians were forced to labor in the construction industry in Russia. In November 2011, 75 children were reported missing in Sucre, 38 of them were found, the others are victims of human trafficking. According to the Law, all forms of human trafficking in Bolivia are prohibited. It prescribes penalties of eight to twelve years of imprisonment. Bolivian Government tries to raise public awareness and cooperates with international organizations and NGOs (Non Governmental Organisations), but the major problem is still domestic trafficking. Parents who live in rural areas give their children to so-called grandmothers and grandfathers who will provide them with education and food. Such practice is very common in the country. Besides that, children may be easily taken across the border by people who are not their parents. The Bolivian law says that the signature of two witnesses is enough for authorization. There were cases when signatures were simply bought and children were taken across the border illegally despite the border controls. Sometimes young girls or children show up on the border alone without any documents and there are no shelters or adequate services to help victims of human trafficking. They can be picked up only by their relatives and it usually takes a lot of time to identify them. Even though there are some religious groups, children’s shelters and NGOs that take care of victims, provide trainings to general population and police, still it's not enough, as they are available only in several parts of the country. To stop this problem, it must be done on governmental level. The government is to contribute more to trainings, shelters and to raising public awareness of human trafficking. In the year 2000 United Nations Protocol to Prevent, Suppress and Punish Trafficking in Persons, especially Women and Children prescribed the '3P Anti-trafficking Policy Index'. It measures the effectiveness of government policies concerning this problem. The highest performance in these policies is demonstrated by the Netherlands, Australia, US, Germany, Italy and Sweden. Compared to these countries, Bolivia has a lot to do to impove its efectiveness and get a higher position in the list.